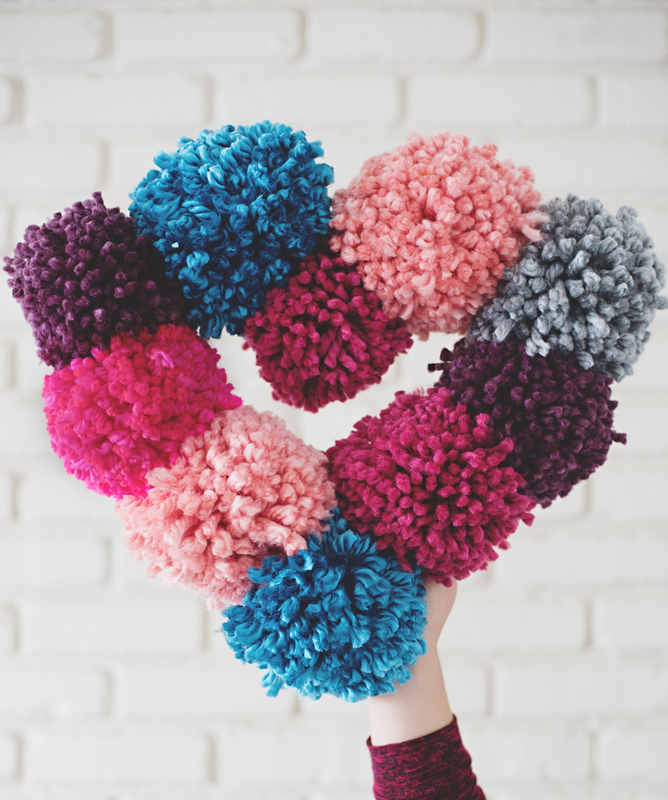 Inside: A fun and festive heart wreath DIY project with just a heart wreath form you can create this fun pom pom heart wreath! Creating a cozy corner of the house or a comfortable welcoming wreath is something I love to do every fall. 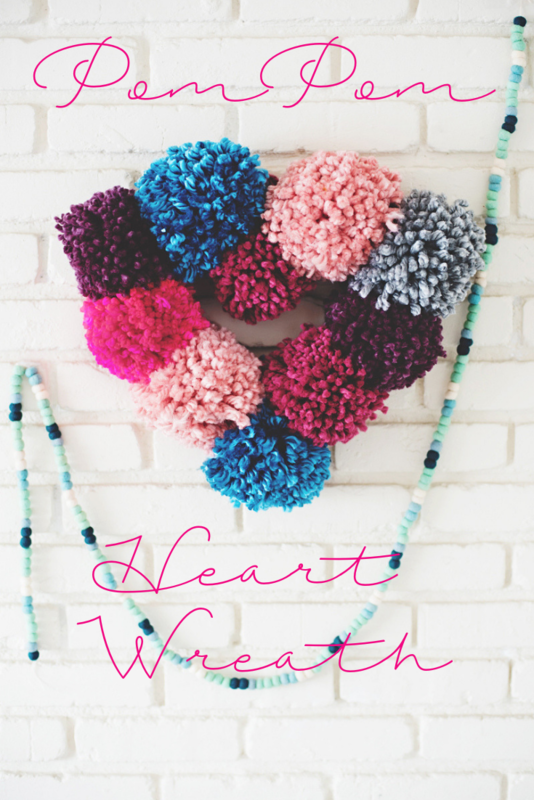 This pom pom heart wreath DIY brings a burst of color and fun to the scene. The huge amount of texture it has will quickly inspire everyone to relax in the coming seasons of cozy home time. After making one wreath, I quickly wanted to make 100 of these beauties for every room in the house and everyone I know. 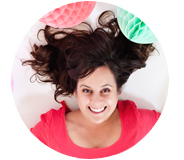 We have a new book coming out in a couple weeks all about crafting with Pompoms. 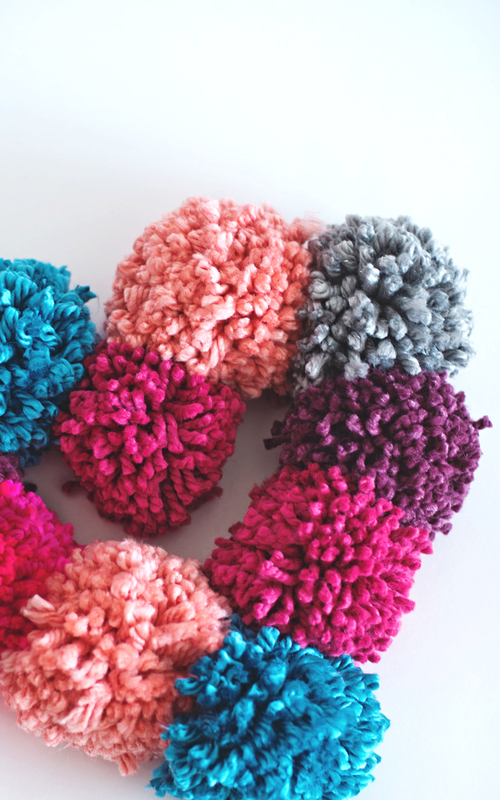 Creating big pompoms is one of the easiest crafts imaginable. You can whip up a wreath like this in under an hour! 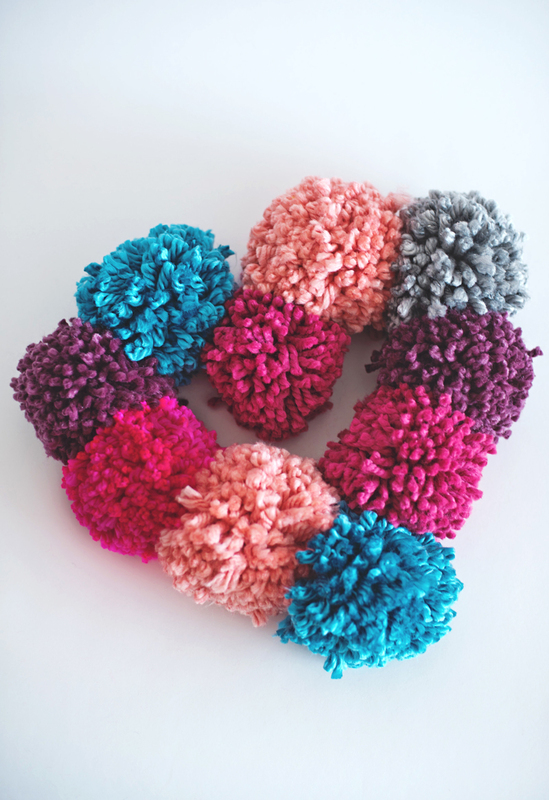 Try it out and order the book for more pompom crafting fun right here. 1. 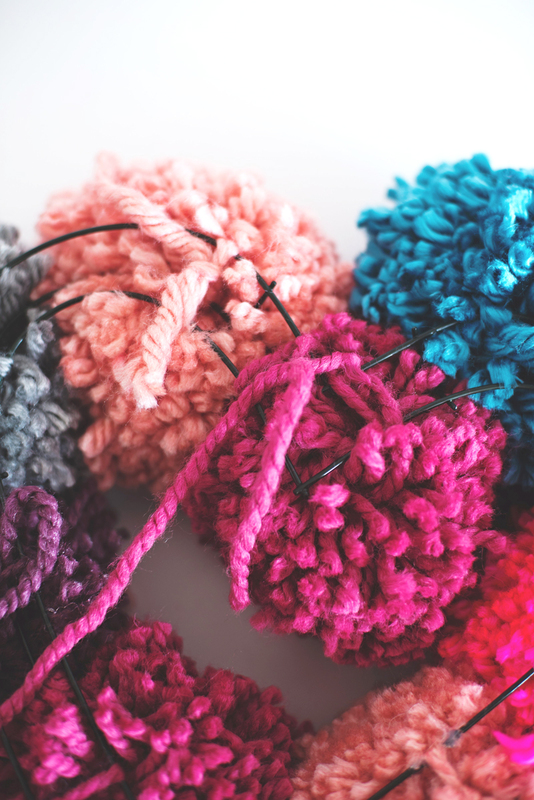 Start by making about 10 large pompoms with the maker. Thick yarn works the best for this project and although you could easily adjust the colors, there is something about the subtleness of a color combination that really makes the wreath work. 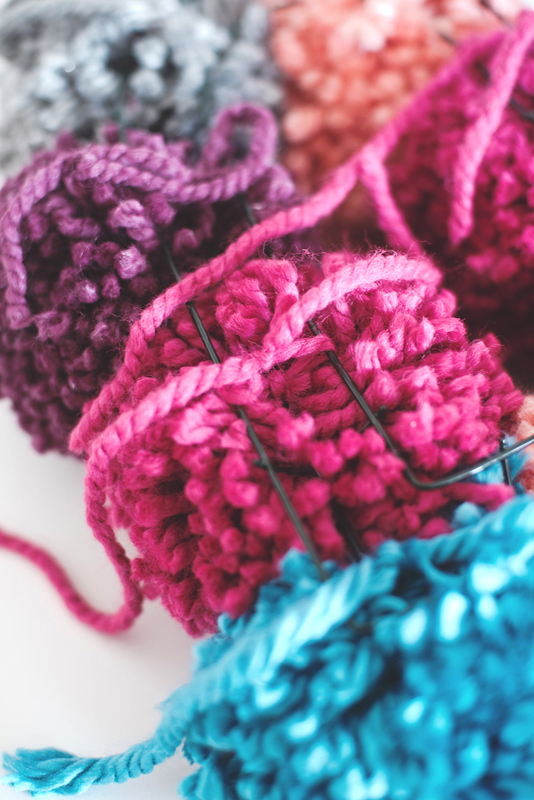 As the yarn is tied off be sure to keep the ending yarn lengths extra long. 2. Once the pom poms are made lay them out in the pattern you envision along your heart wreath form – leaving the two long yarn pieces up towards the ceiling. 3. Gently lay the heart wreath form backside up onto the heart you’ve created. Adjust the placement as needed to fill out the heart wreath diy. 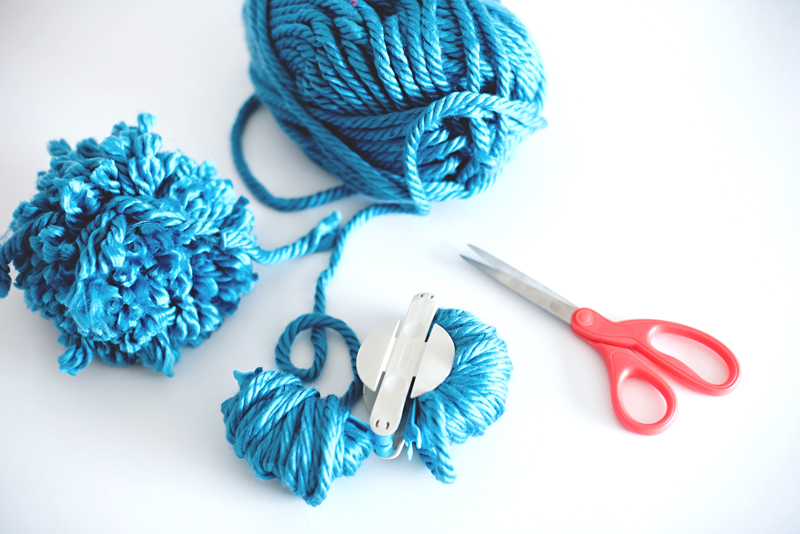 Then start tying the pom poms into place. Use the three different metal layers as added stability, tying each pom through a number of times to hold firmly into place. 4. Tie a length of the extra thread up the backside to hang the pom pom wreath diy on the door or wall or anywhere that needs a dash of cozy this time of year. The heart wreath diy will quickly put all your guests at ease and has such a gorgeous way about it. What areas of the home are you getting ready to make cozy this time of year? For more fun and festive Valentine to go with your heart wreath diy decor check out these projects: Valentines Day Backdrop, Handmade Valentines, and this hot and steamy Valentine Balloon Surprise! 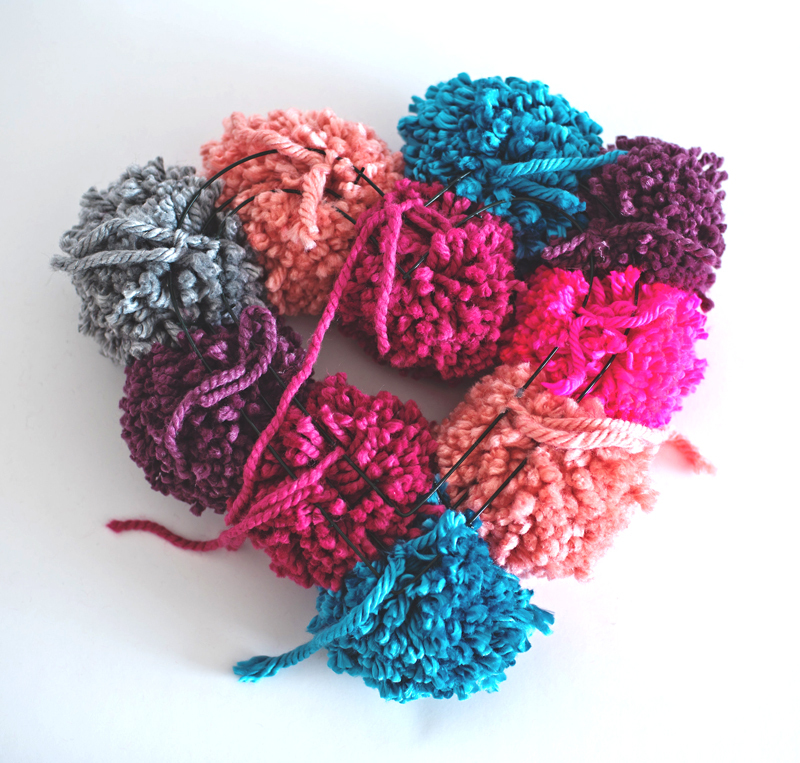 Pom poms have to be one of the most delightful things ever invented!